The history of the German division and reunion: In several dioramas you can experience the history of the German division and reunion with the example of a street corner in the middle of Berlin. Many small scenes bring the history of this time back to life. Many Germans remember the East-West divide from own experience, most remember the reunification and almost everyone knows the effects of the divide on today’s German society. So do we. Nevertheless it is not as easy after 18 years, to keep in mind, what the division meant for millions of people in everyday life. Walking through the streets of Berlin-Mitte and realising, that within minutes the former German borders can bee crossed several times, makes it hard to grasp. We believe a lot of people feel this way, especially in the younger generation. When life experience becomes history, this is probably a normal process, and still this history has an effect on how we live with each other today. Does the Miniatur Wunderland have the chance to provide historic experience through their models? We believe: yes! This is how the idea for this exhibition started. 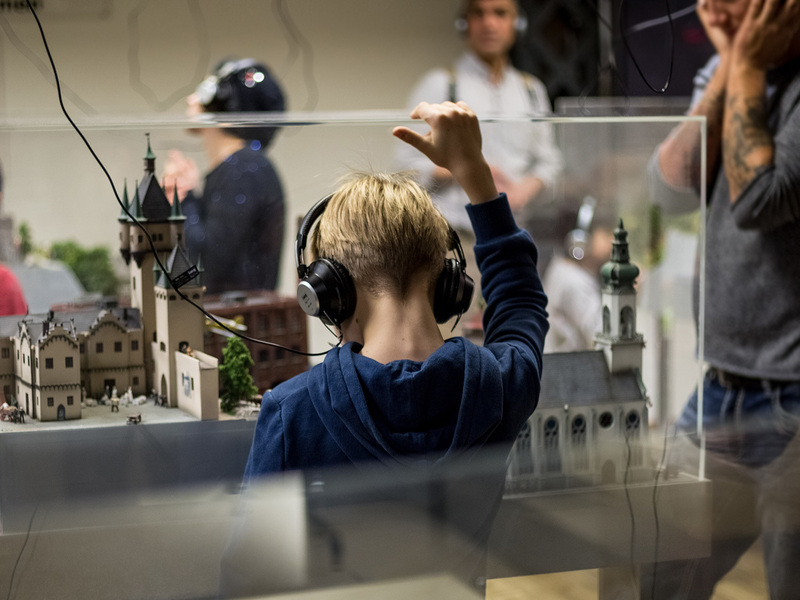 Together with the Hamburg Center Office of Political Education, the Miniatur Wunderland developed the concept for the exhibition. With use of the seven dioramas we especially want to provide the possibility for students to grapple with history more vividly and give people who are already out of school a chance for in depth memory. The dioramas show a virtual crossroads in Berlin, divided into East and West. Virtual, because this enables us to show a large variety in a relatively small space. On first glance the dioramas picture the look of each era in East- and West-Berlin, looking deeper you will discover, that many incidents and life circumstances of each era are being looked at from different angles by using symbols. Even though a lot of things in history are a given fact, we are aware, that they were perceived differently by each person‘s point of view. We have tried to integrate as many facets as possible, although we are sure we couldn’t replicate everything. The exhibition opened in September 2008.